I’m beginning a sermon series through the book of Job. This is a daunting task for me partly because the book is very long and would be tough to cover a few lines at a time each week, as we do with most other biblical books. The “action” is found mostly in the first two chapters and the last one (3 of the 42 chapters!). Another reason is that much of it is poetry and should be read and understood in ways that may be foreign to us. Finally, the book deals with enormous matters of emotion that require much wisdom and a high tolerance for ambiguity. When I was a boy I heard my preacher say from the pulpit, “Every preacher knows he’s matured when he’s ready to preach the book of Job.” That stuck with me some 40 years! Well, I’m not sure I’m ready, but here goes. The book of Job opens peacefully. You can almost hear Beethoven’s Sixth Symphony, “The Pastoral,” playing gently underneath. Job is a priest interceding for his children: “He would rise early in the morning and offer burnt offerings according to the number of them all. For Job said, ‘It may be that my children have sinned, and cursed God in their hearts.’” Job is a king ruling his domain marvelously well: “the greatest of all the people of the east.” But Job has not yet matured to prophet status, and that brings on a storm that is frankly terrifying. This “blameless and upright man who feared God and turned away from evil” is struck down again and again with God’s full knowledge and consent. 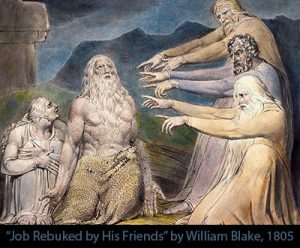 Shockingly, most of the book of Job is bad advice. Job’s “friends” are wrong, and the record of it comprises the largest part of the book. Why would the Bible spend so much space on advice not to be emulated? There are probably a number of correct answers, but one is so that we can rightly see ourselves in Job’s friends and be like them. You probably won’t be surprised to hear me say that the book of Job is about the gospel of Jesus Christ. To be clear, the gospel here is not about substitutionary atonement, but about the God who comes to us, not on our terms, not leaving us unchanged in our this-world happiness, but redeeming lives in a world that has been torn apart by the storms, i.e., the whirlwind, of life. Come hear it preached and enacted in the supper with Jesus this Sunday.